Engaged in service providing the services like Living and dining hall - Air-Conditioned, with sofa, table, dining table, TV, fridge and Washing machine. Every creation in Green Meadows has a interesting story. One such is Bali House - A Deluxe cottage with four well furnished rooms, made from 100 years old coconut timber brought from Bali Islands , Indonesia to create a international ambience. The resort has got 22 rooms, out of which 16 of them are traditional wooden houses each narrating a unique story. Unwind and relax in our Deluxe rooms featuring queen beds with cosy duvets and feather pillows with the comfort of well maintained Air-Conditioning. 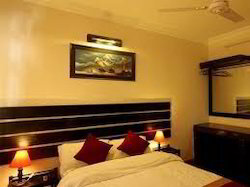 TWO person is permitted in the room @ Rs.2250+Tax as applicable. A splendid room absolutely stunning for a holiday break! Our Hotel's Deluxe Queen Size Room will render you an unraveling holiday experience. - The Extra Large Deluxe Suite is generally meant for two persons stay. It is provided with queen size bed. - This exceptionally big air-conditioned suite is provided with large twin writing table and chair, TV and a large wardrobe.